Who can say why you'd order 100 chicken nuggets in a single sitting. Maybe you're a giant. Maybe you're having friends over. Maybe you want to Frankenstein a chicken back together. That's up to you. Whatever the plan, you probably want to know about this deal if you're going to order 100 chicken nuggets this week. Burger King says it's back in the "nugget wars" and is offering a 10-piece order of chicken nuggets for just $1 starting on October 11. 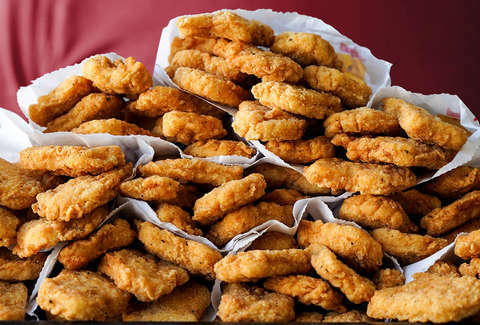 Everyone in the country is getting the 10 for $1 deal, but you'll have to be ordering from Los Angeles, Miami, or Fort Lauderdale if you want the limited edition 100-piece pile o' nuggets. Though it doesn't take a degree in matheology to know that, with the nationwide deal, you could still get 100 nuggets for $10. You'll just have to skip the free delivery and the limited edition label when you ask for 10 orders of nuggets. If that doesn't present enough of a challenge to your stomach, feel free to see what happens when you eat the chain's jet black slushie or the new Nightmare King sandwich, which has bright green sesame seed buns. At least the slushie is providing some, um, interesting results.